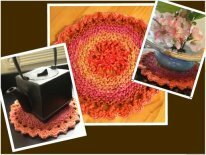 Knitting patterns for home is a page where I link to patterns that we use at home such as placemats, mop covers, dishclothes, and cup cuddler. Anything that related to home and home decors will be listed here. Feel free to suggest a pattern you like. Enjoy! 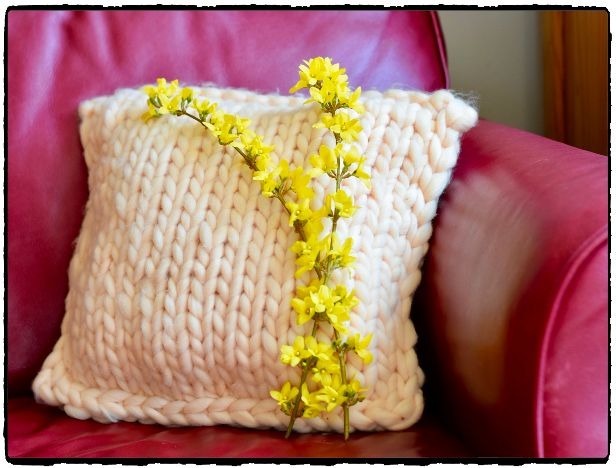 Chunky Yarn Plush Pillow - Great for home or for kid. Make one in a day. Easy, fast and fluffy! Pretty Bookmark With Eyelet Laces - I would make it with wool instead of soft baby acrylic next time, so it will be a little firmer. Any way, I love how it turned out. Hope you give it a try! 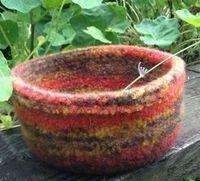 My first felted basket - Another quick project for your weekends. This basket is knitted with double strains of pure wool and then washed in a hot water in a washing machine. It's a fun and useful project to make for friends and family. A quick project for summer days using left over yarn. So get out you leftover and start knitting this cute case. Keep it or give it away! Like vibrant colors? 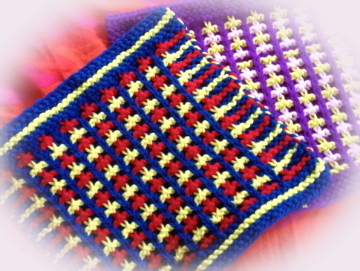 Try knit these pot holders in these color combo. Choose and pick colors of your choice. It is about 8.5" long in diameter. This mat is great for any use in your home. 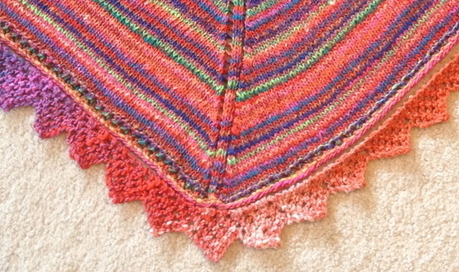 It a good left over yarn project. I made two of these and 2 coasters out of one skein of Noro yarn and I still have some yarn left over. Mitered Coaster is a very easy project you can create in a day or less. Make a lot of them for yourself or as a gift. friends. 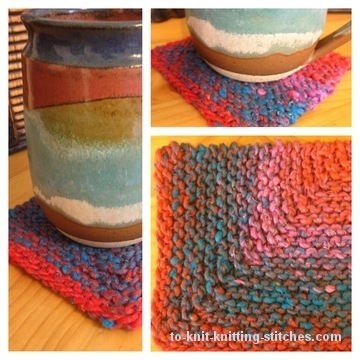 I knitted this with a beautiful Noro yarn which I didn't intend to use it for a coaster. I love it though. Fast and fun to knit lacy dishcloths. Knit them for yourself or give them away as gifts. This is one of my favorite dishcloth collections. I gave these away to my friends along with hand-made soaps. They love them! 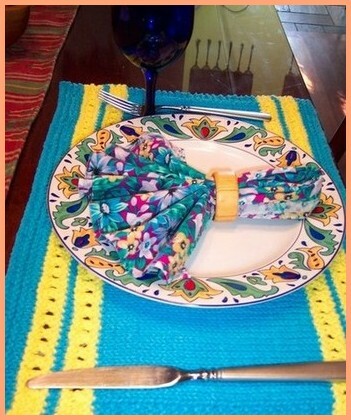 This colorful placemat is knitted with 100% cotton yarn from Bernat. Choose any of your favorite colors to mix and match your style. 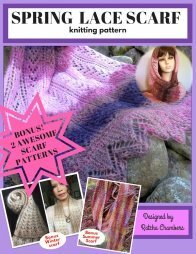 The pattern is easy enough for beginning knitters. Tip: Don't know what color to choose? Get out your China and find yarns that match its colors. 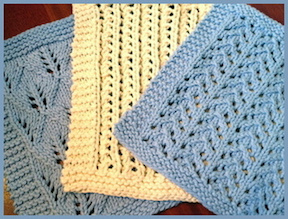 Knit these easy mop covers in simple stockinette stitch or in slip stitch ribbing pattern. I used double strains of yarn for maximum cleaning. The patterns can be customize to fit your personal mob. Finished measurement 15 " x 5" with 2" top border. 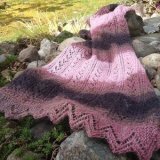 This is an old lacy edge pattern I thought people might enjoy knitting it. This lace would make a great edging for different projects such as pillow, blouse, dresses and towel. Easy Eyelet Edging - A simple and easy to knit edging for your home projects. 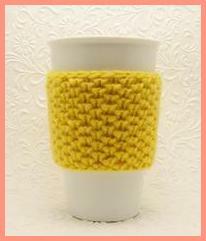 Love this cup cuddler in half-brioche stitch. 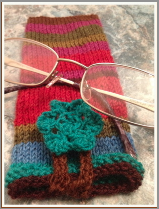 What a great way to use up those left over yarns and keep your hand from burning! This pattern designed by Kara Mayfield of California.